Darci Lynne Farmer, 13, and Petunia sing ‘Summer Time’ at the Allen County Fair on Saturday. LIMA — Hundreds of fans of Darci Lynne Farmer flocked to the Allen County Fairgrounds Saturday night to watch her perform in the grandstand. Farmer, 13, from Oklahoma City, Oklahoma, won season 12 of “America’s Got Talent” last year and has since been touring the country with her ventriloquism act. Last week, she made an appearance on “America’s Got Talent” once again, performing with Petunia. Allen County Fair Manager Bob Fricke knew she would be a hit with fair audiences. “Everybody got to watch her win ‘America’s Got Talent’ last year, nationally, so a chance to bring that type of act into the fair, bring it to Lima and Allen County, [was a] great opportunity, and where else can you go without traveling to see a show like that? 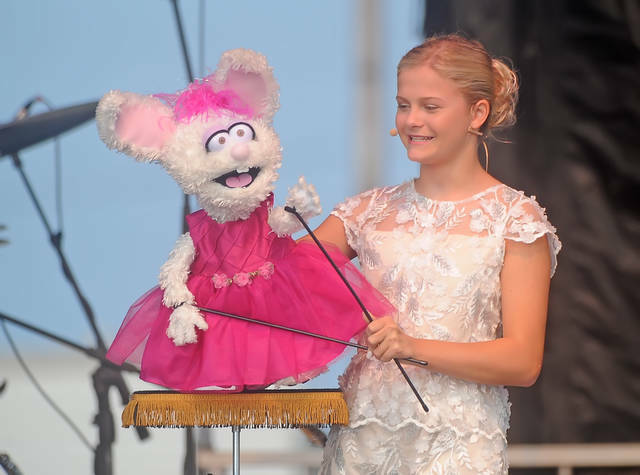 It’s right here at the Allen County Fair, so we’re excited about having Darci Lynne here,” said Fricke. Farmer brought out several of her character puppets — Petunia, Oscar, Katie, and Okie — much to the delight of her fans. “I just told him on the way to the fair today that she was going to be there and I said, ‘Do you want to go see it?’ because I knew he really did like watching her on ‘America’s Got Talent,’” said Rachel Walther, Jaxxon’s mom. Mom was really pleased to have a family-friendly act to enjoy with her son. “I’m really glad about it. I think it’s different and something we can all do together. I’m just glad to be here to spend the day with my son today and just have a mother and son day at a nice event where we can ride rides all day and go see a good show in the evening,” she said. Booking family-friendly acts like Darci Lynne and Friends takes some planning and some luck. “That’s what the fair is about. It’s family friendly, getting people out here, exposing them to things they can’t see anywhere else or you have to travel to see, but when we’re looking at our entertainment, whether it’s free grounds acts or headlining grandstand acts, that’s always a big consideration and just trying to figure out what people want to see,” said Fricke. This entry was tagged Allen County Fair. Bookmark the permalink.